"My name is Matt Napier and I want to see an end to world poverty. During a trip to Nepal 11 years ago, I first realised how bad poverty can be in developing countries. I couldn’t face going back to my home in Australia and leaving these poor people behind when the only difference between us was the country we were born into. I had all the opportunities in the world but was wasting them, so decided to set my focus on becoming a voice for the world’s poor and since then have become an anti-poverty advocate. Now, I’m no expert in International Development or a genius with a cure for the world’s ills, so what could I do? 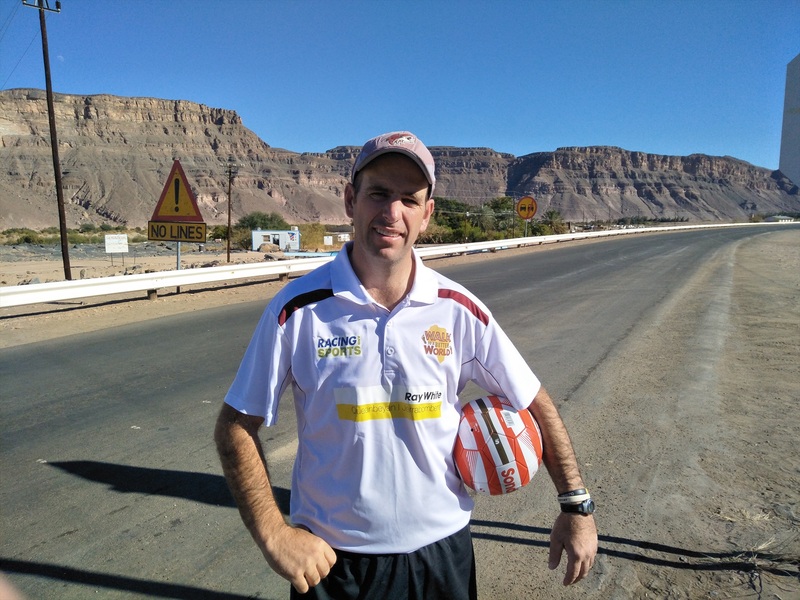 I decided to undertake extreme long distance adventures and use this to raise awareness of poverty, talk to schools and politicians and raise much needed funds for projects that I believe have the greatest chance of stopping the cycle of poverty. So, in 2012 I cycled 3,800km across Australia and then in 2013 I bounced an Aussie Rules football from Perth to Sydney. These adventures were so successful that I then set my sights on Africa and in 2016 I walked 2,300km across southern Africa from Walvis Bay in Nambia to Maputo in Mozambique. I raised $62,000 through four separate chuffed campaigns (one for each of my charity partners) and also gave out over 200 soccer-balls to schools and community groups along the way. Oh yeah, did I mention I kicked a soccer-ball the whole way!? This year I am walking 1,860km from the southern border of Namibia to the northern border with Angola. It will take me through some of the harshest terrain on earth including the Namibia Desert and the infamous Skeleton Coast. This year I have two charity partners – Empower Projects and Caritas Australia – and aim to fund a specific project through each of them. Each project is unique but the thing that they both have in common is that they work with the communities to identify their needs and solutions that will work for them, and then they support them to implement them in a way that is sustainable and will create long term change. I am currently one week into my 7 week journey and although I am finding it a bit tough at the moment, I am encouraged by the support I have received and the emails I get from Chuffed telling me when someone has donated."